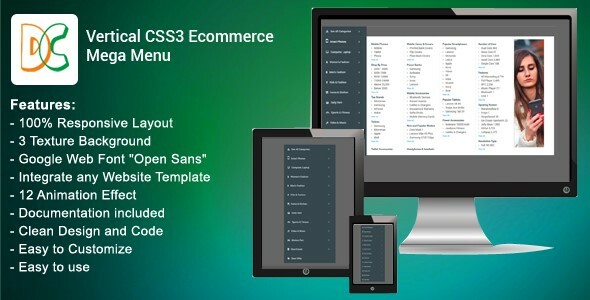 Vertical CSS3 Ecommerce Mega Menu - CODELISTPRO | Free Premium Scripts, Plugins, Apps Source Code. The CSS3 Ecommerce Mega Menu is a professional CSS2 & CSS3 Ecommerce Menu compatible with any Website template. This menu comes with Vertical and sticky version and 12 different animation pattern. Responsive CSS3 Ecommerce Mega Menu is a flexible and high customizable to build your custom Responsive menus. It is very easy to build a vertical CSS menu. you can easy to used and setup any template CSS3 Ecommerce Mega Menu item. all list drop down by mouse hover. You can choose three type of texture pattern with choose in 12 Different animation.